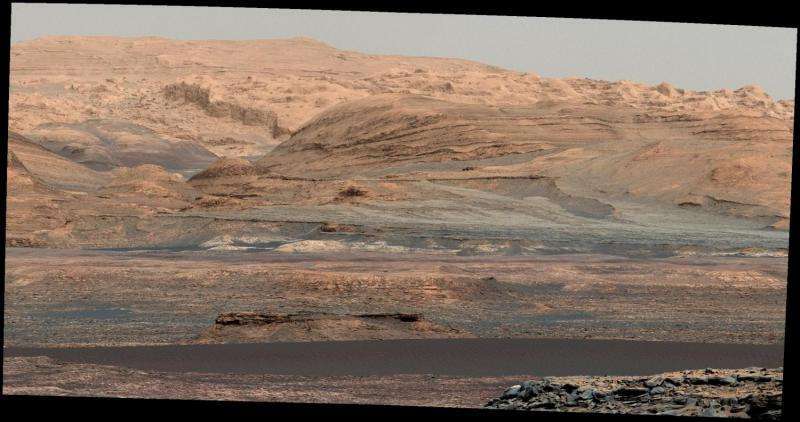 On its way to higher layers of Mount Sharp, NASA's Curiosity Mars rover will take advantage of a chance to study some modern Martian activity at mobile sand dunes. In the next few days, the rover will get its first close-up look at these dark dunes, called the "Bagnold Dunes," which skirt the northwestern flank of Mount Sharp. "These dunes have a different texture from dunes on Earth," said Nathan Bridges of the Johns Hopkins University's Applied Physics Laboratory. "The ripples on them are much larger than ripples on top of dunes on Earth, and we don't know why. We have models based on the lower air pressure. It takes a higher wind speed to get a particle moving. But now we'll have the first opportunity to make detailed observations." No Mars rover has previously visited a sand dune, as opposed to smaller sand ripples or drifts. One dune Curiosity will investigate is as tall as a two-story building and as broad as a football field. The Bagnold Dunes are active: Images from orbit indicate some of them are migrating as much as about 3 feet (1 meter) per Earth year. No active dunes have been visited anywhere in the solar system besides Earth. Ehlmann and Nathan Bridges lead the Curiosity team's planning for the dune campaign.